I don’t have many “heroes”. There are many people who I have learned from, and there are many who I have the utmost respect for. But there are some that stand out as real influences and some of those are heroes: one of those was Robert Alexander Baron Schutzmann von Schutzmansdorff. 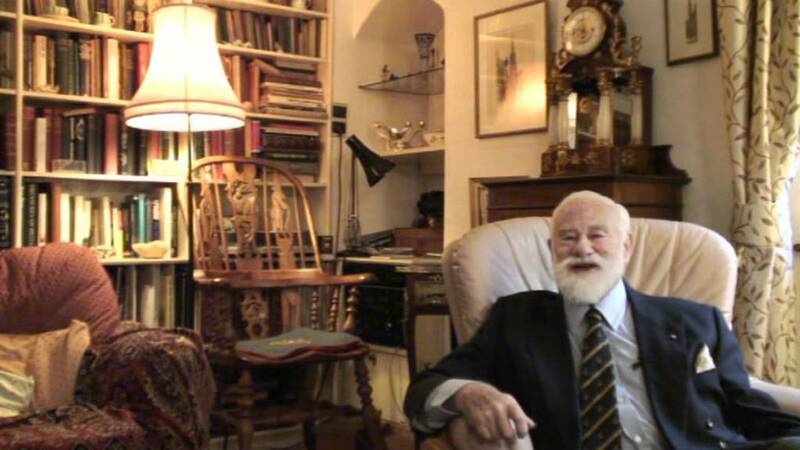 Robert, known to most of us as Bob Symes, died yesterday, aged 90. I didn’t know Bob, and Bob didn’t know me, but I was surprised not so see any obituaries for him yet, so I thought I’d add my little footnote of respect on his passing. Bob is responsible in part for the way that I communicate – enthusiastically – because I realised whilst seeing him on Tomorrow’s World and on re-runs or VHS of his Model World programmes from a young age, that the best way to engage people about interesting little things was to show people that you were really, really cared about them. I remember giving what could be described as an “impassioned” talk to my prep school about some of my model trains. This apparently involved a lot of wild arm gesticulation, very fast talking and racing tiny trains in very fast circuits around my feet on the stage on Hornby track. Oddly, that gained me some new friends rather than lost them. Bob’s enthusiasm, interest and joy shone through in everything that he presented. Not trite, not smug, never snarky or rude, his style was to sweep the audience along with his charm, his knowledge and his real passion for sharing the stuff that he was experiencing or doing. Whether it be model villages, model railways, miniature aircraft, inventions or gadgets, he wanted to show the world – and that means you, every one of you – that the miniature or the minutiae could be fascinating and worth our time to take a closer look. He shared his interest with a knowing smile through his trademark beard and a twinkle in his eye: he had a mischievous sense of humour (and many stories will soon be shared about that, no doubt). That desire to share and continued at home, where he and friends built two extensive railways in his garden. One was a vast “Gauge One” railway (the same scale as at Bekonscot Model Village), which regular viewers of BBC Tomorrow’s World will have remembered – sometimes he and the producer contrived ways in which the model railway could be used to discuss some new full-size innovation. Brilliant. Second was the Green Dene Railway, a 10.25″ gauge ride-in railway which ran for a few hundred yards up the garden. Occasional open days saw Bob and his wife Sheila share their wonderful home with guests, letting them see something of the content little world that they had created. Bob was a great supporter of many organisations, and encouraged others to do their best and try something fun or different at every opportunity. And that’s the great thing: he proved that whilst model and miniature railways are a wonderful and rewarding hobby to have on one’s own, they can be even moreso when they’re not taken entirely seriously; when the garden gates and regulators are opened wide, the tea is served, corks are unscrewed – ultimately it’s all about us having fun, and sharing our fun together. You can watch some of his work, online here and here – “The Model World of Robert Symes” is quite, quite lovely. A true gentleman: may he enjoy playing trains forever. I meet Bob at an exhibition many years ago a charming chap with a wonderful sense of humour. Typical was his recommendation of crushed garden gnomes as a base for outdoor tracks. That’s a great tribute to the great man! I’ve just been watching all the old VHS recordings of his mid 1990;s program “Marking Tracks” As Bob was very into gauge 1 and miniature railways, I’m sure he would have loved Bekonscot! Does any one know if he ever visited? A wonderful gentleman, in every sense of the word. I met him when I went on a tour of Austrian railways that he escorted and hosted in 1987 , and I’m sure his knowledge and connections gained us ‘perks’ that other groups wouldn’t have had (e.g footplate rides!). I kept up with him for a while in later years, but regrettably we lost touch after I moved out of his area. My dearest respect to Mr Sykes who I did not know, but was so kind to me in regards to writing to me a few years back, as he lived in green Dean cottage, honeysuckle lane ,east Horsley, the cottage that once was my uncle’s back 60 years ago, of which I had so much fun and spent so many summers as a child. Very sad . His models were wonderful and an inspiration to my friends in the U.S.